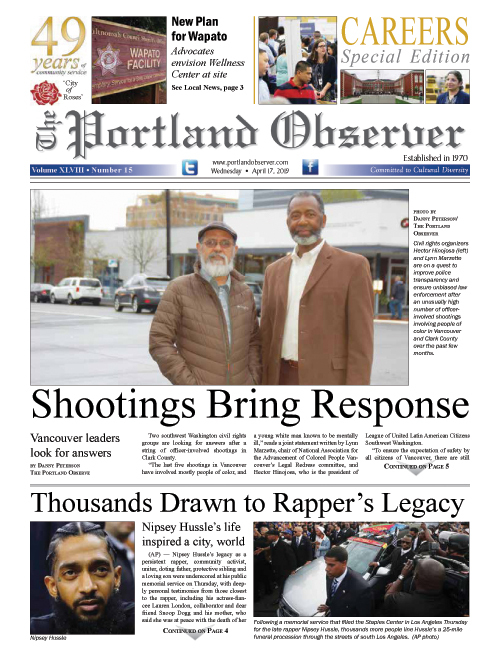 A beloved staff member and role model for an alternative high school serving Portland’s black community, who passed away in January, has been honored posthumously for her life’s work and dedication to students, families, staff and others. “She learned the circumstances that caused barriers to student attendance and proactively helped identify and implement solutions,” read a resolution from the school in gratitude to the long time staff member that was presented last Wednesday to her surviving family members. Grandma Pearl came to Rosemary Anderson High School through Multnomah County’s Grandparent Program, but officials said she became everyone’s grandma, making the school and its co-program Portland Opportunity Industrialization Center a home for all. The resolution noted how she was devoted to welcoming students each morning and how her calm presence changed the atmosphere of the entire building by cultivating trust and respect. “Grandma Pearl made Rosemary Anderson High School a better place by bringing out the best in people, their best behavior, their best attendance, their best work,” said the proclamation signed by RAHS Board Member Amy Angel and the school’s principal, president and chief executive officer Joe McFerrin II.